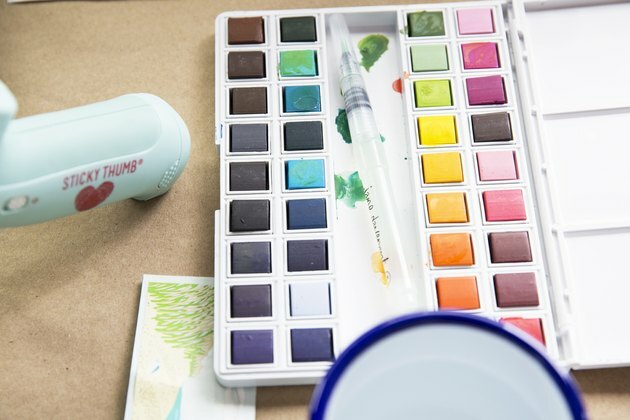 Amy Tangerine, designer, blogger, and author of Craft a Life You Love, is all about making your passions a reality through creativity and a spirit of adventure. 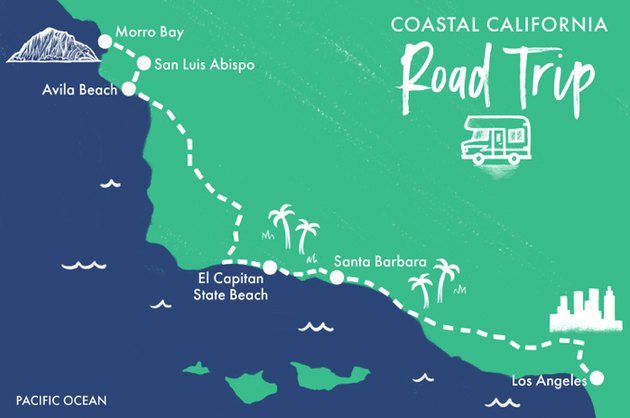 Amy did just that when she decided to Go RVing up the California coast with her husband, JC, and their 4 ½-year-old son, Jack. They left Los Angeles on a Friday. They stopped in Santa Barbara and then San Luis Obispo, where they made a pit stop at a friend’s sticker shop to stock up on supplies. Finally, they ended up on the beach in Morro Bay, where they gathered sand dollars to create a DIY shadow box to capture memories of their first RV road trip. Luckily, their RV had a cozy table where they could easily set out all their materials. 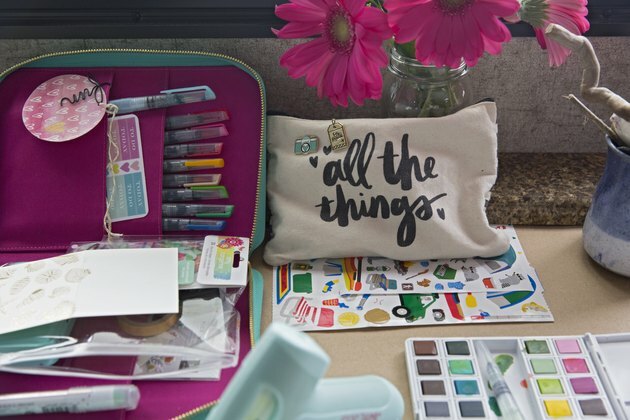 For most of her on-the-go crafting efforts, all she needs fits in her Planner Pouch, which has interior pockets and a clear, zippered envelope perfect for markers, tape runners, mini scissors, pins, stickers, and more. “Sometimes I bring a date stamp and ink pad,” she adds. And last, but not least, the portable printer toprint memories right off her phone. Jack’s interest that day surprised her. “He ended up painting so many sand dollars he was able to give each and every person [they met] a memory of the trip,” says Tangerine. “The shadow box I created is a little atypical,” says Tangerine. Most shadow boxes have the elements layered or falling down, with sand at the bottom, for instance, and then memorabilia on top. While they did collect memorabilia and take photos, the concept Tangerine used was slightly different. 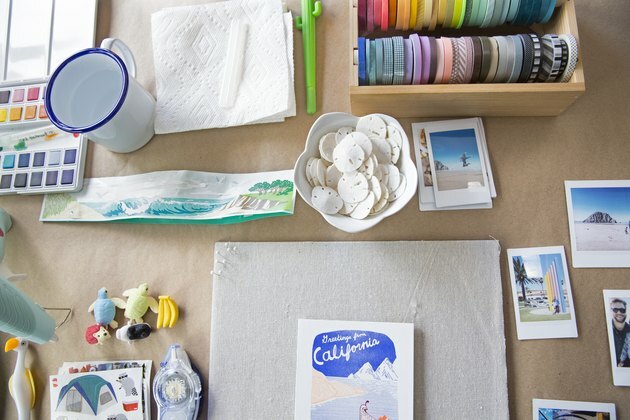 “This was 12x12 canvas that you could pin things to, like a mini memory board that was framed and personalized,” she explains. Don’t stress about the theme.“The main thing is to focus on getting the project documented,” says Tangerine. “In other words, don’t worry too much about the details. Choose your favorite photos, a few of the elements you want to preserve. You can add little bits along the way,” she says. Three is the magic number. When it comes to layout, Tangerine generally goes with whatever appeals to her at the moment. “I tend to stick with rule of thirds—but knowing design principles means you can also break them when you want to make the design yours.” For her, odd numbers look best—though like anything it’s a personal choice. 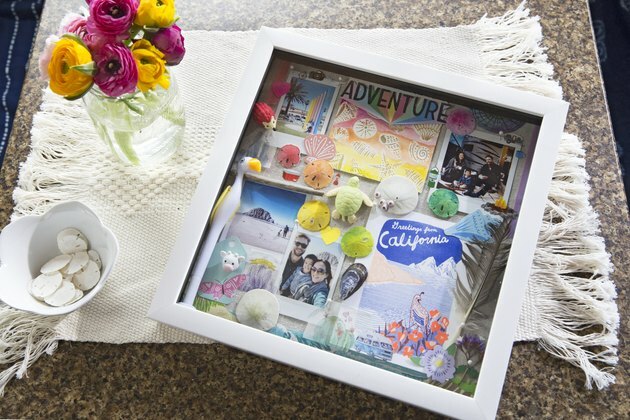 With this shadow box, she chose three of her favorite photos. Don't be afraid of color. Tangerine loves all colors—and is not dogmatic about keeping one palette. “You don’t have to stick with color scheme if you don’t want to,” she says. For this shadow box, she wanted a rainbow of colors, to mix and match with the more natural elements. “The collected memorabilia was very unique to the trip,” she says.